How Can I Tailor Seimei To My Interests? Namu Houjyu Myouhou (Na-mu Ho-ju Myo ho) is the chant given to the world by the Founder to fulfill wishes, quiet the mind, and remind us that when we use our Seimei, everything flows. This chant is available to everyone. Seimei is the vital force behind our life, and this type of life force is in everyone and everything. Over the centuries, life force has been studied and named many things. The word Seimei translates as vital force (but has many other meanings in Japanese.) The founder of Seimei, Toshiha Hiraki, also calls it our "Buddha Nature." Everyone has a vital force that works for them and Seimei is in everything.The difference here, is that Toshiha Hiraki has been able to awaken one's Buddha Nature, give it power and motion (kibetsu and jyouka) and then teach us how to use it time and time again, quickly, without our own bodies getting heavy. In fact, our bodies get lighter and we get healthier when we use our awakened Buddha Nature. The results are measurable each and every time. Using this part of ourselves influences everything around us: family, work, pets, home, plants and situations. This is the marvel of Seimei. Most anyone can be awarded the power (some physical restrictions apply) and then rely on their Seimei to put that power and motion behind pain relief, affecting change, or even working on someone long distance. There are many healers in the world today and many healing techniques. We do not call ourselves healers and this is not just a healing technique-even though Hiraki decided to demonstrate it's power through pain relief. This is because people of all nationalities have pain. Hiraki is trying to get us to move from our Buddha Nature, so he awakens it and gives it motion and teaches us how to use its astonishing power. This is a new concept for Americans who want a "quick fix." In Seimei, this is a life-long practice of learning to use this part of ourselves as we serve humankind. In Japan, hundreds of people have their pain lightened or removed or health conditions significantly addressed with teachers and students working side by side at the temples there. This is real power and the stories and results are endless. An awakened Seimei gives results quickly time and time again. 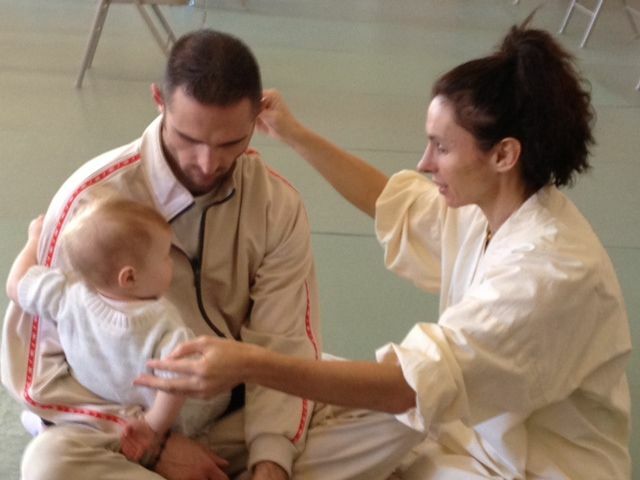 In the US, each week, lead instructor Nicola Bertolo helps Seimei students take away the pain of people with a wide variety of health problems using techniques learned from the Levels I-III class. Pain is gone, conditions are relieved - each and every week -no matter what the condition. Would you like to be able to have the confidence and power to take away five different symptoms in five different people and give them relief all in a short amount of time? Your Seimei can do this without you touching them, whether you are on a trip, at a shopping mall, or visiting a friend. You always have your Seimei with you. When it is given power, you can use it endlessly and in many different ways. One new student said it was like having the capability of having a swiss army knife in one's palms, in that the various tools on it, could be utilized for any situation and she felt totally prepared to do anything in life. As a result of using our Seimei, we impact our performance, health, relationships, and our communities in a positive way. Students have an edge in solving problems and making change and this is demonstrated each and every day through thousands of Seimei powerful stories. Because Seimei cannot be seen by the naked eye, once it is awakened, students continue to improve their skills by keeping current. This can be done in several ways: a) by visiting one of two teaching centers: Morristown, New Jersey, Santa Fe, New Mexico, or returning to Saga, Japan b) by attending a special practice space weekly or monthly or by c) using our Seimei regularly. Seimei requires practice. After acquiring the skill, students practice it, just like tennis or golf. Students can flex their Seimei "muscle" by doing such activities as helping to relieve pain, changing the taste of juice, or working on a pet or flower garden. Seimei offers advanced practice: returning to Japan, chanting, enrolling in higher classes, participating in community or Foundation activities, offering leadership, or helping run community-based healing clinics. Many students visit Japan as often as possible for an immersion experience and to “tune up” their Seimei. Advanced students use their Seimei in everything they do. In Seimei , students use their Buddha Nature to affect change: a change in the nature of pain, a change in a situation, a change from stagnation to motion. Therefore, the word practice in Seimei is both a noun and a verb! Most people would agree that Vital Life Force is everywhere-in everyone and in everything. From physicians to yogis, philosophers to talk-show hosts, many individuals have once studied or talked about Life Force and its attributes. Seimei is the awakening, and giving power to, this life force, which Founder Hiraki calls our Buddha Nature. Everyone has a Seimei , or Life Force. One of Seimei’s most interesting attributes is that one does not have to believe in it for it to work. This part of ourselves exists and the study of Seimei helps us recognize it, know it, learn about it and discover it. The Seimei Foundation teaches the potential and practical application of Seimei and demonstrates its potential over and over again--this is in fact, what makes Seimei so amazing. It used to take several years to learn some of the more advanced techniques of Seimei. But now, enough people are doing it, the class for the first three (of ten levels) are a total of 50 hours, ten of which are in Japan. This is a lot to accomplish in the classes and we love watching the wonderment appear on people’s faces as they remove pain from the body the very first night. "This is much more than I expected," one student said. "Your scale is 1-10-I give this class an "11" each and every day!" offered another. For fifteen years, the Seimei evaluations of this class have been nothing less than exemplary. Please join us for a weekend of exploring your Seimei or talk to anyone who has been awarded this power and then taken this class. I was so sad the next day. Then I realized it was actually my Seimei that was sad. That was the deciding factor for this investment. It was an investment in the higher part of myself and I want to honor and care for that part. I'm so grateful for this opportunity in my life. Thank you to all the practitioners out there that realized that Seimei is more than pain relief and share their Seimei with people like me. It is a way of life and an upgrade to my life. BAM. Everything is different." S.M., 2015 student.